Last week I was repainting our living room, work that invites having the radio on in the background. And even if it doesn’t, having paint on your hands prevents you switching the thing off. And so it was that I heard three programnmes back to back bearing on similar subjects. The first was the news, on which it was announced that the government planned to force hospital consultants to work at weekends to ease the pressures on the National Health Service, now expected to be “available on demand 24/7”. The second was the last of a series in which the writer Will Self took a 50Km walking tour of the Large Hadron Collider, interviewing scientists involved on the way. One encounter that struck him was with a physicist who, having been on that and related projects for twelve years in search of the solution to his particular problem, claimed never to have even thought about the greater implications of this fundamental research for the nature or meaning of the world. The third programme was an examination of the fashionable spin-off of Buddhism called Mindfulness, which noted with interest how big companies are sending their staff off on meditation courses in order to improve their productivity … and, of course, to help them as human beings (meaning, essentially, preventing them burning out and going sick). One agreeably non-traditional Buddhist worried that such practices actually remove the heart of what such meditation is about, which is not to enable one to work fifteen hour days for corporations, but to enable one to question why one should even try. The common thread of all these, maybe impressed on my mind by the strange state of altered consciousness I get with prolonged physical work (does anyone else find that? ), is work. Work, that is, as an anti-creative force. Work, I note, was an integral part of human activity from the Creation, that being mankind’s given “creative” role in the accounts of both Genesis 1 and 2. I take it, referring to the matter of my last post here, that work will be a positive and rewarding aspect of the new creation too. 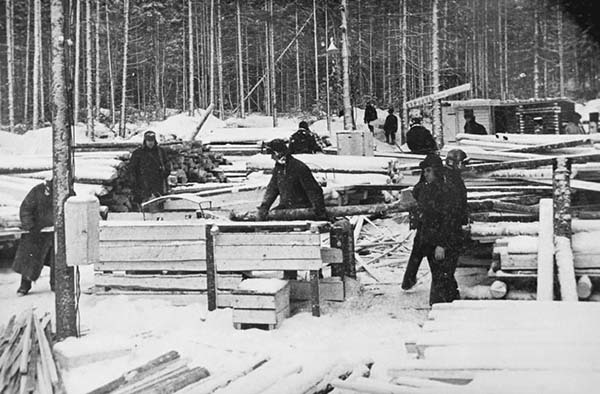 In the interim, because of the judgement summarised in the curse on Adam’s cultivation of the land, work has become a more ambiguous matter – necessary to keep us alive, still frequently rewarding whether exercising creative originality or, as Alexandr Solzhenitsyn experienced, logging in the Soviet Gulag, and yet onerous, sometimes forced and often excessive. I suppose I should try and define work, as I sought to do for my retired or redundant patients when they felt its loss keenly. I suggest it is, at root, activity carried out on behalf of others. Recompense is not mandatory – the gentleman scientist or the charity shop assistant is still working, and the slave certainly is too. But I don’t think the keen gardener is truly engaged in work, for all his activity, until he enters his prize marrow in the village show or opens his garden to the public. For my part, although retired, I spend a lot of time working, this blog being one element, and making music of one sort or another much of the rest. Neither would be satisfying unless others, now or potentially in the future, gained some benefit from them – I don’t really get much out of mere hobbies. Because I set my own work now, I’ve only myself to blame if it’s unrewarding, but the curse of Adam still touches it if, for example, others disapprove of what one does or, as occasionally happens even now, one bites off more than one can chew – I suffered something of a surfeit of playing carols before Christmas. In paid work, of course, the downside is usually more evident. Historically, choosing your work, or how you do it, has been the exception rather than the rule. Many have worked endlessly and still been unable to support themselves. And work has often shortened life – not one of my ironworking Garvey forbears survived middle age, though their wages were higher than average. But today I’m interested not so much in the frankly sinful aspects of work, whether that be work that is intrinsically criminal or immoral, the personal exploitation of workers through niggardly payment, slavery and the like or even the addiction of the workaholic. Instead, I want to concentrate on a less obvious but no less real anti-creative aspect, what one might call the institutional abuse of work. Some Christian interpreters would see this in terms of the New Testament’s “powers and principalities” understood sociologically, spiritually or both. So, for example, to enslave an immigrant and keep him in your basement is a simple moral failure. But to live in a society which only functions because of slavery, as did the New Testament writers or those living in eighteenth century America or Britain, is a deeper matter. It is harder to recognise and much harder to resist. Let me apply that to my three radio examples. Regarding hospital doctors, I have been one. My first job had a basic 72 hour week, with a compulsory active on-call rota (at 50% rate) making up 112 hours. The pay increased, and the hours improved, through my career, especially when I took the decision to abandon the hospital treadmill for general practice. Even so, I missed out on much of my family’s growing up, no doubt with lasting effects on them, and could have missed more if I hadn’t wrestled with my conscience by prioritising time at home over professional meetings out of hours. Yet in fact much of that workload felt positive, because it was in the nature of the job: these were my own patients, and their illnesses refused to comply with my office hours. One felt something of a sense of heroism in working longer hours than anybody else, once liberated from the disrespect of the hospital adminstrators. The government’s current attitude, though, is that hospital consultants are well-paid, so damned well ought to be available at all hours. The elephant in the room is that there’s no point in a high salary if you have no time to spend it. The writer of Ecclesiastes wisely said that a man who cannot enjoy his prosperity is worse off than a still-born baby. The high suicide rate amongst doctors, double the national average, is partly a reflection of that. In this case, in fact, the demand for constant availability is not being made to deal with emergencies, but with the public’s desire to present routine health issues when it is most convenient. But of course, that desire is in turn based on the fact that the public, too, are being required to work seven days a week, whether they be shopworkers compelled to work on Sundays to cater for care-workers tied to their homes by zero-hours contracts in case they are needed, or executives competing with each other to be at work longest with an eye to the promotion ladder or the next redundancy round. Neither should one forget academics maximising their output of papers because they are worried more about funding and tenure than significance. All this, though, is being done not to stave off starvation, but to maintain a lifestyle of … 24/7 work and meaningless activity. It’s not efficient, it’s not human – it’s communal madness. The concentration only on the job in hand, ignoring the bigger picture, is not limited to particle physicists. It’s endemic in the institutionally overworked. I remember, when I was a student, a top executive of the chemical giant ICI discharging himself from hospital immediately after a heart attack because the company needed him at a meeting. Which meant, in the end, that the shareholders “needed” their profits to pay their train fares to work, or perhaps the private medical bills when work stress caught up with them. The company doesn’t even exist now, though it outlasted its loyal, and now forgotten, functionary. And that’s why to grab ten minutes of “mindfulness”, at company expense, in order to help Google take over the planet, is actually a blow against the whole created order. I’m neither a Buddhist nor a meditator, but simply as a Christian discipline have always seen the need to step back from doing to being once in a while – to experience the moment, and particularly the depth and meaning of the creation all around. To remind myself why, in the end, I’m working and living at all. Socrates was not wrong to say that the unexamined life is not worth living, and we live is a society that positively prevents us – not least through work-obsession – from engaging in that life-affirming task of self-examination and reflection. When the tools of self-examination – whether that be the somewhat overrated mindfulness, or prayer or just arts and literature – become merely therapeutic ways to maintain the machinery of distraction, then it’s an almost satanic perversion of what it means to be human, and in particular what it means to work. By custom, from childhood onwards, our customs enforce living to work rather than working to live. In the end, it makes our culture little less of a slave-state than the worst historical examples.